The aroma is fantastic, a heady blend of clove and pepper and cinnamon, punctuated with a hint of vinegar. It’s blessedly cool inside, in contrast to the blasting midday heat that bounces off parking lot asphalt. A burst of contagious laughter welcomes newcomers. The savory/sweet scent evokes a familiar hominess, crumpled napkins and empty plates provide evidence of a recently devoured meal. It smells like community. This particular feast was courtesy of resident Abtesam Bedam. “I made kabobs, pickles and Iraqi samoon,” she says. Apparently, that heavenly fragrance emanates from the seven-spice blend that goes into the kabob meat, meant to be served tucked inside flatbread along with tomato and a slice of homemade pickle. Delicious. Gatherings like this have become familiar. Every Friday, a small cadre of USD Master’s Entry Program in Nursing (MEPN) students, led by Clinical Instructor Jodi O’Brien, PhD, RN-BC, NE-BC, make the trip from Alcalá Park to El Cajon and get up close and personal with residents. The project is part of a class — Nursing Practice with Care of Diverse Families in Communities — that aims to “see how folks live and manage their health,” says O’Brien. 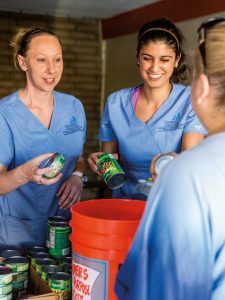 It’s part of the program requirement for MEPN students to put in clinical hours that include not just hospital experience, but community work. 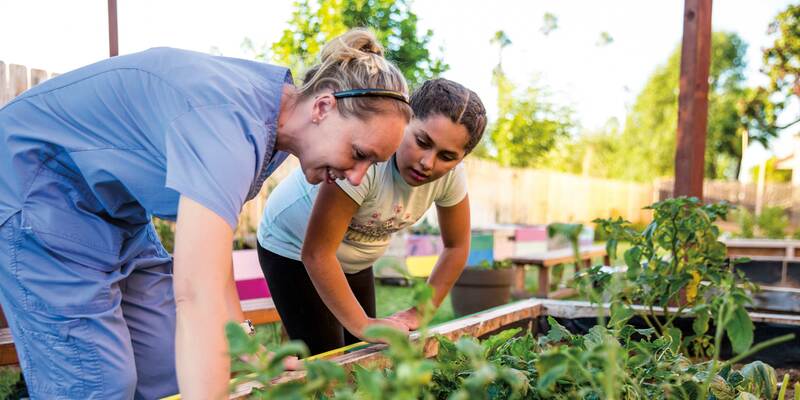 Quick to see a need and do the work to fill it, the dearth of options in this neighborhood “food desert” organically led to the idea of establishing a community garden. “There were lots of patio plants around doorways — mint, tomatoes, cilantro — so many that it could have been a fire hazard,” says O’Brien. But making the idea reality hasn’t been without challenges. Linda Sue Beagle, the complex’s community coordinator, says the project has been a huge success. “A garden is something that’s essential to everybody’s life. It’s a way we can come together.” She adds that the resident children have been a big part of their efforts. Mariam and Mohammed Ahmadi have become regulars in the garden, which is tucked out of sight around the back of the last building in the complex. A half-dozen large raised boxes — some painted in primary colors — are home to plants in various stages of growth: zucchinis, tomatoes, herbs, carrots, even a few stalks of corn. A pair of sturdy wooden benches beneath shade sails run between the two rows of boxes. Morgan Colletta ’18 is ebullient when she talks about the how far this community-building project has come. “We did a lot of outreach, knocking on every single door and explaining who we are, what we’re doing, what are goals are.” Colletta has a quick smile and a rapid-fire delivery, eager to share stories of how they got here from there. 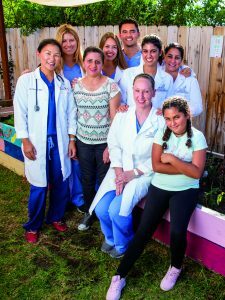 The human connection is what drew these students to pursue a career in nursing. “I’ve loved science my whole life, especially human sciences,” says Evan Gum ’18, who had fully intended to become a physician when he started his undergraduate work at UCLA as a psychobiology major. Gathering with community members in the garden. His natural affinity for putting a human face on health care dovetails nicely with the group’s work to leave a lasting legacy with apartment complex residents. Trust is key to getting residents to get to the point where they are not just seeking advice, but following it. When Ruby makes her entrance after school, it’s with a carton of candy bars, a fundraiser for an upcoming trip to a local water park. At $1 per bar, the price is right, and in truth, it has been 30 full minutes since lunch. Five minutes later, another $10 has been added to her cache. There’s clear affection for the fifth-grader, the oldest of five kids. She wants to be a doctor when she grows up. Her favorite plants growing in the garden? “Tomatoes, lettuce and carrots,” she says with a shy smile. O’Brien is in the beginning stages of drafting the research protocol for a participatory action research study. “It’s a qualitative research method to investigate health outcomes of the garden, as identified by the residents living in this community setting,” she explains. She points out that what’s unique about this type of study is that it centers on health interests that matter most to residents, rather than more traditional research, which typically focuses on the investigator’s own research interests. USD MEPN students help put together disaster-preparedness kits. residents about the evening’s forthcoming event about disaster preparedness. Others head out back to assist in prepping a new garden container for planting. A pair stay behind in the community center to prep the room for the guest speaker, clearing away debris and putting together orange buckets filled with items that might be needed in an emergency. While everyone is busy with various tasks at hand, all of the students have a poignant sense that the end is in sight regarding their own involvement with the center. Once coursework and other requirements for the 22-month MEPN program wrap up, the students will sit for their licensing exams and scatter to launch their new careers. But first, there is dinner to finish preparing. On the menu is homemade pumpkin soup with crème fraiche and pomegranate, alongside roasted pumpkin seeds and fresh fruit. And once again, it smells utterly delicious.